Editorials from Theslowlane: Are greenway levies bad for renters? Are greenway levies bad for renters? I plan to vote yes for Bellingham's Greenways, but there was an interesting point made in a May 10th letter to the editor of Bellingham Herald. Letter basically said "Greenways too costly for renters." It's still cheaper than driving a car. Greenways = transportation. It is true that the property taxes, our landlords pay, are passed along to renters. The Greenways have added a bit to property taxes over the years. This levy is just a continuation of the tax that has been collected over past years. The past levy is expiring. It will not raise taxes, just keep taxes from going down a bit, due to the old levy's expiration. Still this little bit of added cost is worth it, in my calculations. 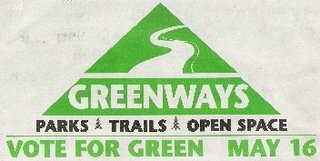 The Greenways is "transportation." It still costs a lot less than owning a car. That's how I see things. Making it safer to get around town by bicycle is worth the money saved as an alternative to driving. Of course there are other things paid by by Greenways; like some park and ball field facilities. These are good things to have also. Encouraging recreation for public health can save lots of money on health care costs and insurance expenses. So I see this as more than icing on a cake. It can be transportation and health. Pragmatic and cheaper than a lot of things we pay for.